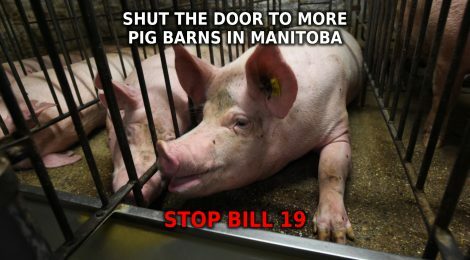 The Province of Manitoba has passed second reading on Bill 19 which seeks to remove the rights of rural Manitobans to say no to new pig barns by gutting the conditional use process, which until now has been used successfully by municipalities to keep industrial pig barns out. By doing so, the government is acting as an agent of the two largest pig slaughterhouses in the province—Maple Leaf Foods in Brandon and HyLife Foods in Neepawa, which have been pressuring the province to increase pig holdings to feed their deadly pipelines. Please help protect animals, the environment and the rights of rural Manitobans by signing and sharing this petition calling on the Manitoba government to withdraw Bill 19.